Shoppe Keep 2 is available now via the Excalibur Games store. As many of you may know, the Helper Bots went on holiday to de-stress. They were bumping into walls, not listening to any orders from the player and generally being a nuisance! 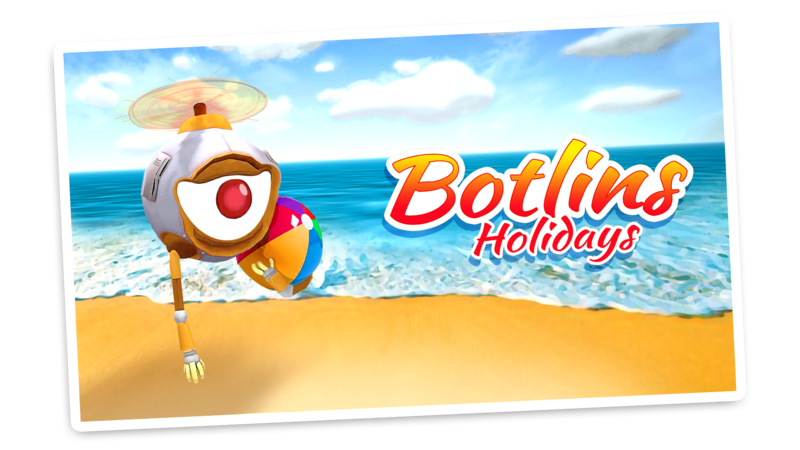 The Helper Bots remained loyal, however, and even sent over postcards while they visited the resort. During their time away they learnt how to relax... but the relaxation levels far exceeded the regular parameters and their programming had taken on certain traits which made them less than helpful. They just wanted to build sand castles, wear swim shorts and get a tan. This was not what we had intended when we sent them to the resort. From the ashes of the Mark V Helper Bots, a new helper bot was created: the Mark VI Botlin. Using everything we had learned from our mistakes with the past Helper Bot we created a much more efficient and reliable model. That very mechanical minion is available to buy from Chris today! They are a little pricier than before, but their skills are now completely maxed out. Chris being the evil businessman that he is, however, created a flaw within the Mark IV bots which means that instead of consuming gold from the vault (which we don't think anyone knew was happening!) the Helper Bots now require fuel. Thankfully a fuel gauge has been added next to the Helper Bots so you know when you are running low. Chris sells fuel when he visits the inn so you might want to stock up when you see him next. Additionally, we've added some new skills to the game. Here are the icons for each of the new skills! They will increase mercenary speed, increase loot from slain enemies or decrease the time it takes to craft items. Someone stole all of the trees and replaced them overnight! Along with a new model of tree, which we believe increases performance on some PCs, you are also able to fine tune the foliage slider in the options menu to increase performance. That's it for this week's update! A full change log can be found below, along with information on how the new bots work. Bots are purchased for an increased price from Chris as they do not have upgrades anymore. Instead, they are better at their job from the get go. Bots now require fuel to work. Fuel can be bought from Chris and filled at the bot docks. They do not use the fuel heavily, but will require refueling every few days under heavy load. Fuel is only consumed when they are emitting smoke. Price gun defaults to roughly 150% before an item is first placed or priced at the beginning of a new game, so new players start earning straight away. Setting a bot to idle will make it await orders. A bot set to stock will restock the shoppe using items within the bot container. However, items will need to be imprinted to displays first in order for the bot to know where to place the items. To imprint an item, hold the item in your hand and then look at a display. Hold left shift and then right click to imprint the item. Repair bots will notice when any display reaches 70% or less durability, fix that display up to 100% and leave. Cleaner bots will instantly move towards any new trash and clean it up. 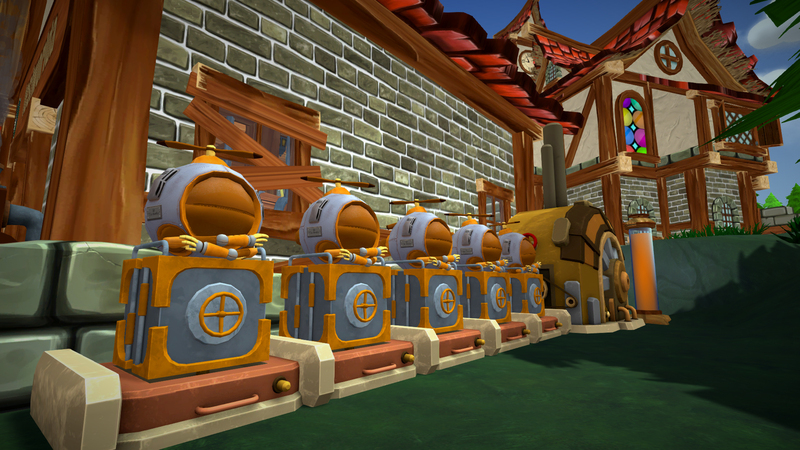 Bots use fuel, a small amount of it while working, displayed in the bot UI as well as visually outside their docks. If bots do not have enough fuel to perform an action, they will display an animated red fuel icon over their head and move towards being idle at their docks. Fuel is purchased from Chris currently, and will be introduced as a craftable recipe by the alchemist in due time.